What are those pieces of crimped metal on the toes of some motocross boots? Those metal pieces are called toe caps and they weren't put there for looks. They're an important part of the boot's overall design and should be replaced if they get damaged. What is a motocross boot toe cap? The small piece of metal crimped across the toe of a motocross boot is called a toe cap, which is attached to the boot's sole by small nails or screws. Many of today's motocross boots have a one-piece welded sole but there are quite a few motocross boot soles that are made of several layers welded together, and the toe cap guards against sand or dirt getting between the layers of the boot's sole which could lead to the sole delaminating over time. The toe caps aren't used just for entry-level boots. Both the Gaerne SG-12 and Gaerne React motocross boots have toe caps, and neither boot can be considered an entry-level boot. What is a motorcycle boot toe slider? A toe slider is not the same as a toe cap. Toe sliders are the oblong protective pieces on the outside (pinky-toe side) of some street bike motorcycle boots. 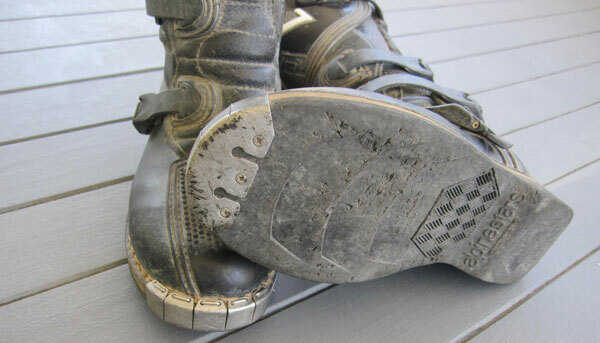 When a street bike rider leans their bike over, the inexpensive toe slider will come in contact with the pavement (or track) and slide along the abrasive surface which helps to protect the expensive motorcycle boot. Toe caps are replaceable, but for a non-competitive rider the toe caps should last many years. If you're a competitive motocross rider you'll probably need to replace them more often, but replacement toe caps are inexpensive and easy to remove and reinstall. The image below shows the metal toe caps on a pair of Alpinestars Tech 4 motocross boots. The boots (used for moderately aggressive trail riding) are seven or eight years old and those are the original toe caps. Your best bet when buying replacement toe caps is to get the ones made for your particular boot because of slight differences in the thickness of the sole, but in a pinch most toe caps should fit other brands. They're sold at most dirt bike stores as well as Amazon or Ebay. Looking at the Alpinestars toe cap replacements on Amazon, the reviews show that a few buyers have used the A'stars toe caps for both Thor and Sidi boots without any problems. One of the reviewers even managed to fit them to a pair of motorcycle boots. The Gaerne SG-12 replacement toe caps don't show any mounting hardware in the image, but the product description says "Fits virtually all mens size MX boots and comes complete with mounting screws". If you're not sure they'll fit your brand of boots, you can always ask a question before buying.